When did you learn how to drive? When did you get your driver’s license? If you live in Europe, it is likely that your answer is somewhere close to 18 years old. The ability to drive yourself everywhere is very important in a young person’s life, but if feels like you have to wait so long for it! However, in some places teenagers have found a way to start driving earlier, ignoring the fact that they look a bit bizarre parking their vehicles in front of popular malls. Even though in most places only people over 18 years old are allowed to drive cars, in Germany there is a A1 driver’s license, which allows you to drive three-wheelers. But how many three-wheeled cars do you know? How many of them are cool enough for teenagers to drive to school, where their friends can see it? Exactly – none. Especially having in mind that a A1 licence also limits the power of the vehicle you can drive – your three-wheeler can only have 20 PS, which is around 15 kW. But where there is a law, there are people trying to go around it. In Germany, if two wheels on the same axis are very close together, the vehicle will be considered a three-wheeler – even if it ctually has four wheels. And there are many cars with four wheels on the market, obviously, so the task is to push two of their wheels close together and to reduce their power to the magic number of 15 kW. There are several companies in Germany doing that. 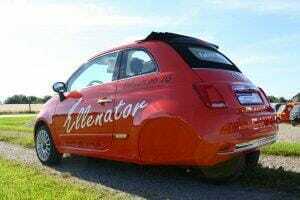 One, called Auto Ellenrieder, is especially famous for producing good looking, A1-compatible cars by modifying some Škoda, SEAT, Volkswagen and Fiat models. Of course, Fiat 500 is the one that everybody wants, but it is not cheap. The conversion costs start from €5,000, but you also have to bring your own car. The price is quite high, having in mind that the vehicle is going to be used for only a couple of years. However, only converted cars offer such benefits as ABS brakes, ESP, airbags, air conditioning, nice audio system, comfortable interior etc. The engine remains the same, it just gets detuned to meet the 15 kW goal, so, potentially, it could be restored to its former glory, if the owner so desires. Or they can just sell the thing to a 16 year old when they don’t need it anymore. According to Autoevolution.com, these cars can reach up to 90 km/h and are allowed to go on the world-famous German autobahn network. So it is an ultimate freedom vehicle. Of course, if only you can get around those weird looks. An invention we use every day – who had the idea of brewing tea in small bags?